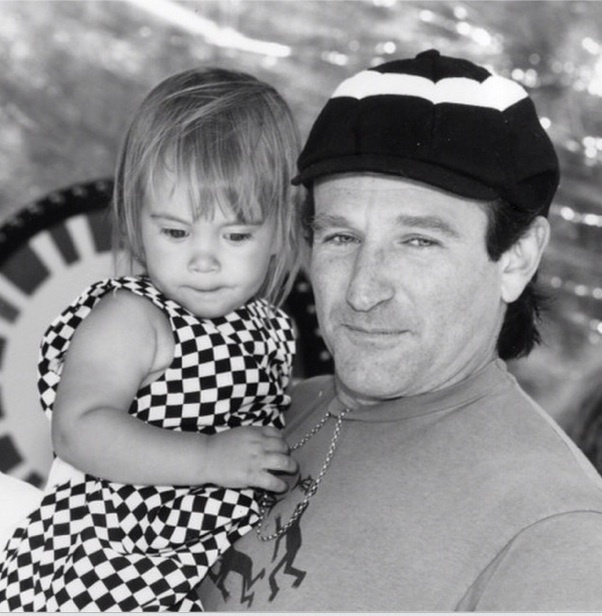 Robin Williams with daughter, Zelda. Robin Williams' daughter, Zelda, opened up in an intimate interview this week about the sudden loss of her father to suicide last year. The 25-year-old discussed the outpouring of support she received from her father's fans across the world, and also the type of person he was off-camera. "It's not to say that people didn't know dad," she told the "Today" show in a pre-recorded interview. "They knew a dad that he was proud of them knowing, because he was an incredibly kind and incredibly caring man. And he was also very private and very calm and very subdued. "The side of him that people know and love and is attached to their childhood, is the characters he had so much fun being," she continued. "And I do think that's what a lot of people will hold on to. That's not going anywhere." Her famous father committed suicide on August 11, 2014 inside his home in Marin County. A pathology report revealed that he was suffering from Lewy Body Dementia (LBD) and Parkinson's Disease at the time of his passing. Lewy Body Dementia Association Scientific Advisory Council member Dr. Dennis Dickson explained some of the symptoms that Williams experienced before his death. "The report confirms he experienced depression, anxiety and paranoia, which may occur in either Parkinson's disease or dementia with Lewy bodies," Dickson explained. Treatment for LBD is "challenging," according to the Mayo Clinic, and Williams' wife reportedly told police that he was complaining about the way his medication made him feel. Other sources reported that the LBD diagnosis was the "key factor" in his death. Zelda, however, refused to speculate. "Diseases, until we find out how they work, we don't have an explanation," she said. "So there's no one I can offer." In regards to why her father took her life, she said that that question was "not important to ask," and that she didn't "think there's a point." Williams, 63, is also survived by his wife, Susan Schneider, and two sons, Zachary, 31, and Cody, 22.